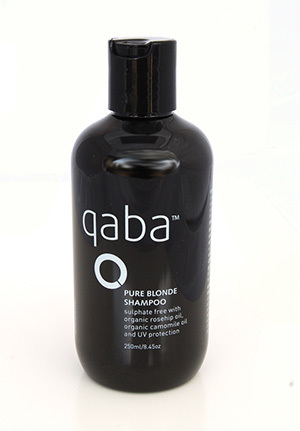 qaba pure blonde shampoo is formulated to prevent blondes from going brassy and help restore, strengthen and protect hair from UV rays. With certified organic rosehip oil, organic camomile oil, certified organic jojoba and certified organic avacado oil for maximum moisture, wheat protein that helps restore dry hair pure organic lavender water to condition and detangle while essential oils stimulate the body mind and soul. qaba pure blonde shampoo harness the power of the qaba molecule with a low pH to gently clean and maintain blond hair to its ideal state. Normal blonde hair is polished. Fine blonde hair volumised. Dry blonde hair is pampered. A must for all blondes. Whether it’s natural or coloured blonde hair. Also extremely good for grey hair and children’s hair. © 2018 qaba. All rights reserved.